We are furiends of Tenth Life Cat Rescue, based in St. Louis. I like to highlight not just diabetic cats like me, but other special needs cats so you humans can learn about how we may have special needs but we are still great furry friends. Just like my human, Tenth Life wants everyone to know that just because a cat has special needs or is a little different, it doesn’t mean he won’t have a happy life. Today, Tenth Life shared a heartwarming story. It made my little feline heart just about melt. Hopefully it will do the same for your big human hearts. Meet Chaos. 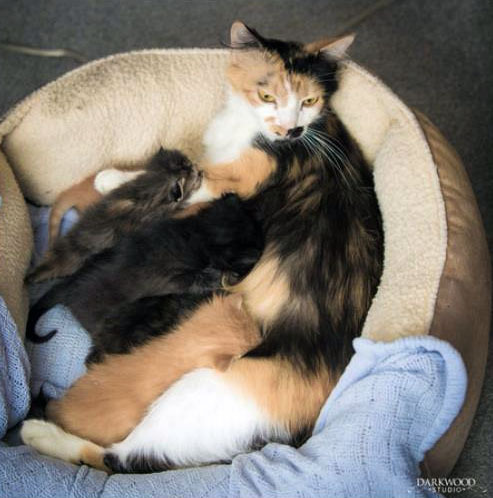 She was rescued by Tenth Life, along with her three six day old babies. And two of her babies are polydactyls just like me! Chaos has been at Tenth Life for about a week, carefully raising her kittens. She has been a good mother, and her kittens are being well taken care of. Today, Tenth Life got a horrible call. A woman found a dead cat in her yard, which is bad. But about a day later, she heard some sad meowing from under her porch. The dead cat was the mother of a litter of six, and they were helpless without their mother. The humans at Tenth Life weren’t going to let those poor kittens starve. So they brought the kittens in, and since they were about the same age, they decided to see if Chaos would raise them as her own. They put the box near Chaos, ready to keep the kittens safe in case Chaos rejected them. What happened brought them to tears. Chaos heard their sad meowing, and looked into the box, very concerned about what was happening. Tenth Life volunteers put one of the kittens near Chaos, and Chaos scruffed that kitten and put it by her own. She did that with another one. Since those two kittens were hungry, Chaos fed them. But there were four other hungry kittens, and Chaos couldn’t get to them because she was feeding the two. So the volunteers took the other four to Chaos. Chaos quickly accepted the others, and cleaned and fed all of them. After taking care of NINE kittens, Chaos was exhausted, but very pleased at what she had done. In order to not exhaust poor Chaos, some of the kittens were taken to other foster homes where they will be bottle fed. But the amazing maternal instinct of Chaos brought tears to the eyes of the volunteers. It’s amazing what the love of a feline like Chaos can mean. You don’t have to be a diabetic cat or other special needs cat to know this.